Maharashtra’s doctor-ironman-endurance cyclist added another feather to his cap; narrates his journey of the biggest stage race in the world. He raised around six lakh rupees with the help of 100-odd people. Two months ago, he had sent a message on Whatsapp asking to buy his merchandise to raise money. Don’t confuse yourself picturing him as a sales lad. No, this message was sent by Nagpur-based-cyclist Amit Samarth who delayed his departure to the Tran-Siberian Extreme Race to gather enough funds. “Every contribution is priceless and makes a difference. 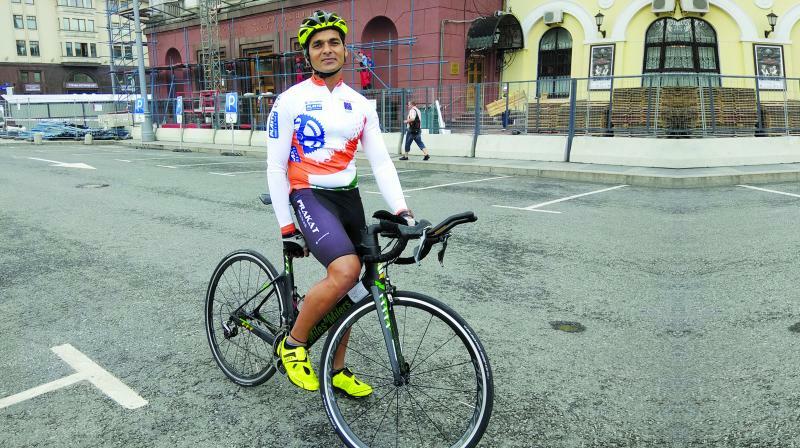 He is the first Indian to race at Trans Siberian Extreme. Help Amit to race successfully at Trans Siberian Extreme,” stated the message. Amit did become the first Indian to complete the arduous challenge of 9,100 kilometres in the race that went on from July 24 to August 17. The race panned out in different areas of Russia, going through seven different time zones and multiple climate changes. He raised around six lakh rupees with the help of 100-odd people. “Your diet, clothes and accessories have to be changed from time to time. For that you need money and I cannot generate that all by myself,” Amit says. Huge hoardings in Nagpur have been put up to congratulate Amit on his feat. Even the Chief Minister has sent him a letter of appreciation. At the moment, he is a hero in the city, but going back to the time when he was running around the Sports Minister’s office in Delhi, the 36-year old cyclist has seen it all. “Now everyone is calling and congratulating. Even some sponsors have called for a few meetings. They did not believe that I could do it,” he says over the phone from Leh where he is the face of another race. The Great Himalayan Challenge, that is starting from Sunday has Amit as an attraction. Amit was among the first four to finish the Trans-Siberian race. It took him 370 hours 51 minutes and 44 seconds. “I got killed over there,” his first words after race. The event started just nine days after the World Cup festivities had ended in the enormous Russian land. The competition is set up in its own way. There are 15 stages with the shortest of 260 kms and the longest of 1386 kms. Amit was cautious throughout and at one point he knew he made a mistake and it was not on the road. “After the second stage, I took a deep tissue massage on my thigh,” he laughs. Now it may sound like a comedy of erro, but then it could cost him the race. “Chalna mushkil thha (It was difficult to walk). I could not even sit. The pain was terrible and it was just the starting stage of the race,” he recalls. He had crossed Nizhniy Novgorod then. Luckily for Amit, this was not his first time going into an endurance race. He finished another expedition called Race Across America (RAAM) last year, which is equal to climbing Mount Everest thrice. More than a physical battle, the Trans-Siberian was a mental ordeal for him. “The definitions of extremities change there,” he says. When he overcame the thigh pain, it started raining. And not the kind of rain that we see here. The showers in those regions come with winds. Awfully cold, the storms hit you like spears. “I was feeling cold and it was a long stretch. It was raining throughout the race and it was that time that I realized if this rain cannot stop me, nothing can,” recalls Amit. Eventually, nothing could stop him but the finishing line. Once he finished the race, came the time when his sleepless nights were accompanied with phone calls and messages. “I was not able to sleep for a few nights and my phone kept buzzing.” Amit had become the first Indian to complete the exhausting challenge of strength as well as will. He also says that this will be his last endurance race for the year 2018 and a quest to better RAAM in 2019 will be on his mind. Now that Amit is called for meetings by many sponsors, his job might be just limited to cycling.